If you have room for larger-than-life affection and companionship, the Great Dane might be your perfect dog. Great Danes are among the world’s tallest breeds. Their short, thick coats can be brindle, fawn, blue, black, harlequin (irregular black or merle patches) or mantle. While some claim that Great Danes were drawn in Egyptian times as far back as 3000 B.C., written descriptions surfaced in Chinese writings around 1121 B.C. The breed we’re familiar with today were hunting dogs used by the Germans to eradicate boar. They were developed in Europe in the 1800s and in 1876 were declared the national breed of Germany. Once their hunting purpose was no longer needed, Great Danes became companion pets. 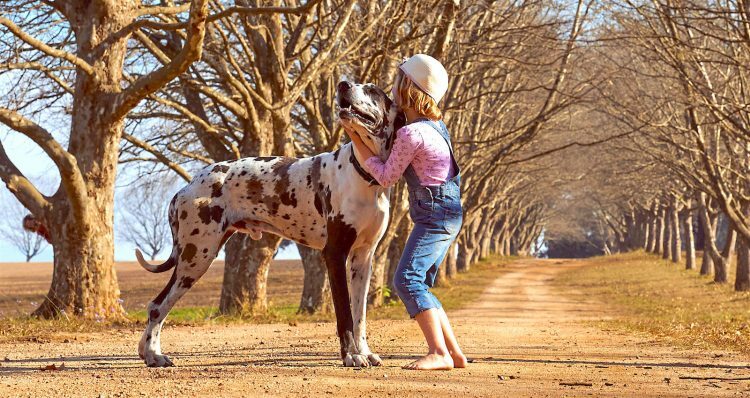 Great Danes can be intimidating, with their large, confident stature, but this giant breed is gentle and affectionate, generally getting along with other animals and people. They do not have a high desire for chasing prey and are very protective of their families, but they don’t intentionally try to cause harm — they really are the gentle giants they are proclaimed to be. Almost 80% of Danes given the American Temperament Test have passed. 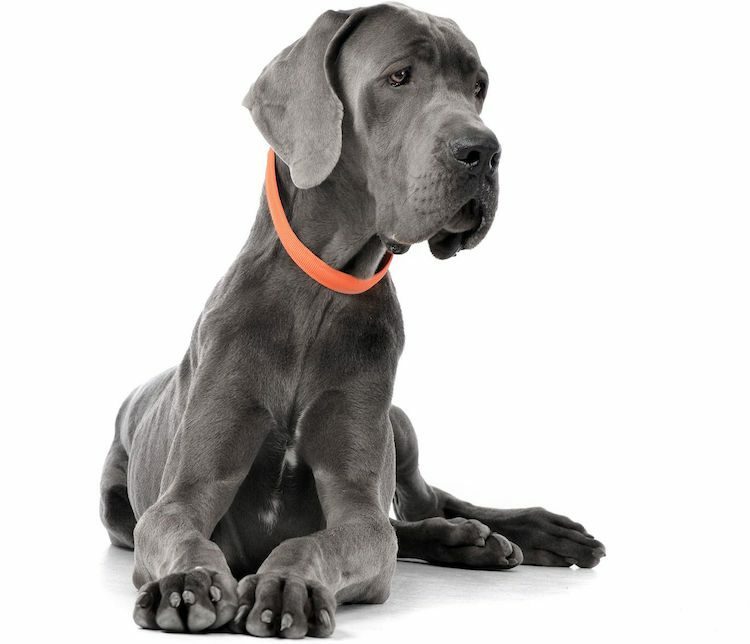 MEDIUM: Great Danes grow quickly and for longer periods of time than other breeds. This puts them at risk for problems with joints and bones. Because of this, you’ll want to limit the amount of exercise given to puppies during their growth. Great Danes need regular walks to keep them on the path to a healthy lifestyle, but excessive running can cause potentially fatal bloating. Consistent and equivalent daily exercise is best for these gentle giants. MEDIUM: Ear cropping used to be done to protect the Great Dane’s ears from the boar they hunted. Today, some people still crop the ears for cosmetic purposes, but the practice is banned in several countries. Regular bathing for these friendly dogs is not required. 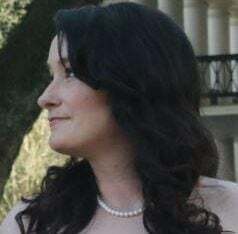 In fact, excessive bathing could strip the coat of essential oils. Shedding is comparable to other short-haired breeds, and a daily brushing will minimize the effects of excessive hair on carpets and furniture. Feeding the dogs at an elevated height and minimizing activity around feeding times can reduce the possibility of bloat. Spaying or neutering is usually recommended to alleviate the likelihood of prostate cancer in males and false pregnancies and uterine infections in females. If you’re looking to adopt, you’re in luck — oodles of Great Danes are available for adoption right now around the country. If you decide to go with a breeder, make sure to ask for health clearances from both of the puppy’s parents. And, as always, watch out for puppy mill red flags.